Windows Phone is now the third-leading mobile phone platform, more than tripling its market share year-over-year and more than doubling unit sales while pushing past a slumping BlackBerry. And Windows Phone could jump into second place quicker than you think. While they’re not Android or iOS-style numbers, Windows Phone sold 7 million units in the first quarter of 2013 for 3.2 percent market share, according to the latest IDC report. Meanwhile, BlackBerry sold 6.3 million units, down a third from the previous year, for 2.9 percent market share — less than half of its share just a year ago. Market leader Android took its customary massive 75 percent of the market, and Apple’s iPhone slipped from 23 percent global market share in 2012 to 17.3 percent share. Those further gains are possible over the next year or two as Microsoft’s primary phone parter, Nokia, transitions to an all-smartphone lineup. Part of Apple’s quarterly weakness was the company’s lack of any new hardware or significant new announcements. That made Apple slip to its lowest global smartphone market share in years, now less than a quarter of Android’s size, with only 37.4 million iPhones sold to Android’s 162.1 million. But systemically, Apple is falling out of the race for smartphone supremacy. And that puts Apple at risk of being in Microsoft’s sights for the number two position in the global smartphone market share battle. Nokia is going all in on Windows Phone — mostly by necessity — and now accounts for 79 percent of all Windows Phone sales. The Finnish company has sold over 20 million Windows Phones to date, which is not bad, considering the challenges of Android, iOS, and Microsoft’s stutter-stepping from Windows Phone 7 to Windows Phone 8. But the real opportunity for both Microsoft and Nokia will come as Nokia continues its transition from feature phone sales over to Windows Phone. The company still sold something like 55 million feature phones in the first quarter of 2013, and while those cheap phones are going largely to developing nations, they will transition at some point to Windows Phone. Those feature phones sales are decreasing, and the transition from cheap feature phone to somewhat more expensive Windows-based smartphones will decrease them still more, but they will be higher-value sales. And, they might just be high enough, depending on what Apple does in the region of a cheaper iPhone, to catapult Microsoft to number two. 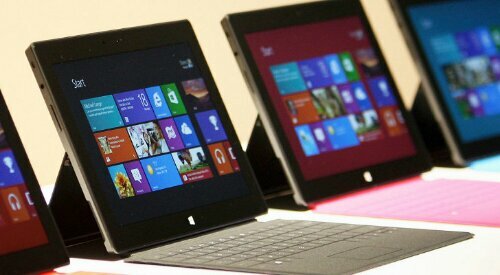 Microsoft will begin sales of the Surface Pro this weekend. The Pro and RT model look alike, but that’s where the similarity ends. The Surface RT (left) and the Surface Pro. With the Surface Pro set to go on sale Saturday, consumers will have a pretty stark choice between two Microsoft tablets that look remarkably similar. When I walked into my local Los Angeles Microsoft Store earlier this week — where the Pro was already on display next to the RT model — it was hard to tell right off the bat which Surface was which. Not surprising, since both tablets display the same Metro screen and there’s a mere 4.2mm difference in thickness. So, let’s recap what sets the Pro apart from the RT version. Price: The RT model with Microsoft Office starts at $499. The Pro without Microsoft Office starts at $899. Compatibility: The RT model is not compatible with older Windows applications. The Pro is. Thickness/weight: The Pro model is about 0.5 inches and 2 pounds, the RT model about 0.35 inches and 1.5 pounds. Disk space/storage tech: The Pro comes in 64GB and 128GB versions, RT in 32GB and 64GB. Note that the Surface Pro’s solid-state drive is fast, the same class of speedy SSDs you find in mainstream laptops. Samsung’s obsession with tubes started with last year’s CES darling, the DA-E750, and now the company is adding vacuum tube amplifiers to home theater systems and even sound bars. The newly announced Samsung HW-F750 is dubbed the “world’s first sound bar with a vacuum tube amp”, which is technically true: like last year’s models, it has a tube preamplifier paired with a digital amplifier. In any event, the difference is largely academic, as I didn’t find that the DA-E750’s tubes added a distinctively analog sound, although it was a good-sounding tabletop system. Aside from the tubes, it’s a pretty standard 2.1 sound bar, featuring one-inch tweeters and a wireless subwoofer. There’s built-in Bluetooth, plus it’s compatible with Samsung’s proprietary SoundShare platform, so it can connect wirelessly via Bluetooth to Samsung TV‘s with the same feature, although I’d be surprised if that didn’t degrade sound quality. Additionally, Samsung’s AirtrackON feature automatically powers on the sound bar whenever your TV is powered on. Samsung also touts an array of sound processing features, including virtual surround sound, 3D Sound Plus and a gyroscopic sensor. 3D Sound Plus supposedly “calculates the depth of onscreen 3D images and configures the system’s depth of sound accordingly”. I wouldn’t put too much stock in that gimmicky-sounding feature, especially from a system that lacks true surround capabilities. The built-in gyroscope senses the exact positioning of the sound bar and adjusts to optimize sound quality. The HW-F750 is scheduled to be released in the first half of 2013. No pricing has been announced yet. The Greek company MLS has made efforts to enter the international mobile phone market and as a result has decided to launch the first ever made in Greece smartphone, the MLS iQTalk™. The device combines voice recognition (Talk) and artificial intelligence (IQ) technologies. The Greek firm MLS started developing such technologies several years ago and consequently put them together in one device. In simple words, this MSL smartphone uses an Android operating system that “understands” and “talks” in the Greek language. More details on the functions of the MLS iQTalk will be announced by the firm itself when the Greek smartphone be available on Greek market in the following days. What about its price, you wonder? It will cost 249.90 euros including taxes and will be available at Greek mobile phone stores. MLS CEO Ioannis Kamatakis commented that people of the company are really excited and proud of this development and marked this first Greek mobile phone as an “extremely interesting innovation.” ”Our goal was for all Greeks that acquire it to enjoy an entirely new level of communication with the iQTalk and at a reasonable price,” he added. MLS is a Thessaloniki-based firm which is rapidly increasing its profit. Despite the smartphone’s “Greekness,” it will be produced in China in specialized factories. If you earn a lot of money, you pay a lot on taxes too. APPLE agrees with this! The New York Times reports on a congressional investigationinto the tax policies of technology giants, including Apple. The Senate Permanent Subcommittee on Investigations is nearly finished with a year-long investigation into the methods that large technology companies use to avoid paying U.S. corporate income tax. Apple, for its part, allocates some 70 percent of its income to overseas affiliates where tax rates are much lower. It appears that all of Apple’s techniques are legal by U.S. law, though some politicians have said that corporations going to extraordinary lengths to avoid paying income tax and that they are violating the spirit of tax laws. In its statement, Apple said it paid “an enormous amount of taxes” to local, state and federal governments. “In fiscal 2012 we paid $6 billion in federal corporate income taxes, which is 1 out of every 40 dollars in corporate income taxes collected by the U.S. government,” it said. Apple was one of the first companies to use the accounting scheme called a “Double Irish With a Dutch Sandwich”, where profits are routed through Irish and Dutch subsidiaries before finally landing in the Caribbean. Now, hundreds of companies use those methods. Apple also has moved revenue to its Braeburn subsidiary in Nevada and International locales where the company pays little to no tax. Apple Inc (AAPL.O) and Twitter are currently not in discussions on the mobile technology giant taking a stake in the popular social networking site, sources familiar with the matter said. Apple in recent months has held negotiations with Twitter to explore investing hundreds of millions of dollars in the company, The New York Times reported on Friday, citing people briefed on the matter. The Wall Street Journal said such discussion were held over a year ago, citing a person familiar with the matter. It is unclear if the two companies talked about a deal in the past and at what level such discussions were held, but there are no current, formal talks between the companies on an investment or acquisition, the sources said. Both Apple and Twitter declined to comment. The iPhone and iPad maker typically does not take equity stakes in companies and prefers to acquire technologies by buying up smaller startups that are lesser known. Twitter executives have said repeatedly they are in no rush to seek additional financing, either privately or on public markets, since they have “truckloads” of cash. Apple has never delved deeply into the social media space dominated byFacebook Inc (FB.O), but it has dabbled in trying to make music more social by launching a social network on iTunes called Ping, which has not caught on. Twitter, the Internet phenomenon with some 140 million users that allows people to “tweet” 140-character messages, is already well integrated into Apple smartphones and tablets. Apple customers can directly share their comments on Twitter when on their iPhones, iPads or Mac line ofcomputers. Twitter, the San Francisco-based startup that is viewed as the most significant candidate for the public markets following Facebook, is ramping up its efforts to generate revenue from the 400 million tweets that cross its networks daily. Eric Setton, the co-founder chief and technology office of Tango, demonstrates its cross-platform mobile app. Tango’s free video calling service has 80 million active users. As the cameras and screens of smartphones and tablets improve, and as wireless networks offer higher bandwidth, more companies are getting into the business of enabling mobile video calls. The details vary from one service to the next, but the experiences are similar: from anywhere in the world with a modern wireless network, a smartphone’s screen fills with the face of a friend or relative. The quality is about the same jerky-but-functional level as most desktop video. Sound is not always perfectly synced with the image, but it is very close. The calls start and end the same way, by pressing a button on the screen. Mobile video calling has risen so quickly that industry analysts have not yet compiled exact numbers. But along the way, it is creating new business models, new stresses on mobile networks and even new rules of etiquette. “All the communications — social messages, calls, texts and video — are merging fast,” said Eric Setton, co-founder and chief technology officer of Tango Mobile, whose free video calling service has 80 million active users. An additional 200,000 join daily, Mr. Setton said. Once an interesting endeavor for a few start-ups like Tango, mobile video has caught the attention of big companies. Apple created FaceTime and made it a selling point for the iPad. In September, the company made FaceTime available on cellular networks instead of limiting it to Wi-Fi systems, almost certainly in response to increasing consumer demand. Last week, Yahoo purchased a video chat company called OnTheAir. And in 2011,Microsoft paid $8.5 billion for Skype, a service for both video and audio-only calls. Though most people use Skype on desktop and laptop computers, the software for the service has been downloaded more than 100 million times just by owners of phones running Google’s Android mobile operating system. Microsoft built a service for its Windows 8 mobile phone that lets people receive calls even when Skype isn’t on. Google, which has more than 100 million people a month using its Google Plus social networking service, now offers more than 200 apps for its video calling feature. It says it is interested not in making money on the applications, but in learning more about them so it can sell more ads by getting people to use its free video service, called Hangouts. Hangouts can be used for two-person or group calls, or for a video conference with up to 10 people. Don’t expect video calling to improve productivity. Tango uses the same technology that enables video calls to sell games that people can play simultaneously. It sells virtual decorations like balloons to drop around someone’s image during a birthday call (both parties see the festive pixels). Google says some jokey applications on Hangouts, like a feature that can put a mustache over each caller, seem to encourage people to talk longer. Currently, popular two-way games like Words With Friends on Facebook work by one player making a move and then passing the game over to the other player, not watching moves as they are made. Another promising area is avatars, like cartoon dogs and cats, that mouth speech when a user wants to have a video call but doesn’t want to be seen. Yet a new etiquette for mobile video calls is already emerging. People often text each other first to see if it’s O.K. to appear on camera. Video messages sent in the text box of a phone, like snippets of a party or a child’s first steps, are also useful precursors to video conversations. Mr. Singhal said making avatars for users of Hangout would be “an extraordinarily important area” as well. The greatest challenge for the business may not be getting more consumers to use the service, but making sure the service works. Most phones have slight variations in things like camera placement and video formatting from one model to the next. “A camera can show you upside down if you load the wrong software on it,” said Mr. Setton of Tango. As a result, the 80 engineers among Tango’s 110 employees have adjusted their software to work on more than 1,000 types of phones worldwide. The top 20 models have more than a million customers each, but the complexity of building software for a wider range of phones has made it hard for new mobile video companies to enter the field, Mr. Setton said. Tango’s average video call used to last six minutes, Mr. Setton said, but when the company started adding other applications to go with the videos, like games and designs that float over people, the average call length rose to 12 minutes. Is it Time for Apple to Get Social? Is Google playing with our Minds? Fab-vintage.com is all about vintage outfits for her! Fab-vintage.com was founded in 2010 with the goal of becoming the premiere destination for online vintage and new-fashion outfits & accessories in amazing prices. Our unwavering focus is on customer's service and satisfaction!